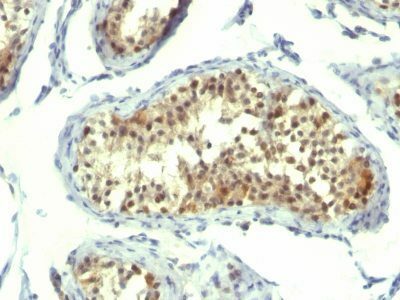 This antibody recognizes a protein of 36 kDa, identified as Thymidylate Synthase (TS) (EC 2.1.1.45). 5-FU-resistant colon carcinoma cell lines (NCI H630R10, NCI H630R1); 5-FU-resistant breast cancer cell lines, MCF-Ad5 and MCF-Ad10. Testicular carcinomas. This antibody recognizes a protein of 36 kDa, identified as Thymidylate Synthase (TS) (EC 2.1.1.45). TS converts deoxyuridine monophosphate (dUMP) to deoxythymidine monophosphate (dTMP), which is essential for DNA biosynthesis. TS is also a critical target for the fluoropyrimidines, an important group of antineoplastic drugs that are widely used in the treatment of solid tumors. Both 5-FU and fluorodeoxyuridine are converted in tumor cells to FdUMP which inactivates TS by formation of a ternary covalent complex in the presence of the folate cofactor 5,10-methylenetetrahydrofolate. Expression of TS protein is associated with response to 5-fluorouracil (5-FU) in human colorectal, gastric, head and neck, and breast carcinomas. Catalog number key for antibody number 0715, Anti-Thymidylate Synthase (TMS715) The prefix indicates conjugation, followed by the antibody number and size suffix.